"The only chap indelibly imprinted on my memory is Steed here. That may be on account of that incident with the Colonel's daughter..."
For overall series reviews, click here. This episode was my first introduction to the Tara King era on DVD, although I have vague recollections of seeing The Avengers "In Color" in the distant past. However, she is more a sideshow in this episode as Steed is the main player. Assorted, seemingly unrelated individuals are oddly killed by being lured into playing an ultimately fatal game that reflects their particular interest. As Steed realizes that they are in fact men that he had know in the Army, he is follows a puzzling trail of clues to try and discover the "game" being played. There is a definite different tone in the style of The Avengers at this point in the show's run. Definitely camp has replaced wit on the humorous side of the series. Perhaps this is the effect of shows like Batman and the ilk, which walked the fine line between funny and silly. This added to the set design, which obviously attempts to take advantage of the novelty of color television. From the electric colors of Tara's costumes (canary yellow, lime green and bright purple) to the green phones and red towels, it all lends a certain consciousness to the proceedings. In Game, we often trip over the silly line, but there is quite unusual turnabout at the end where things get a little darker and more interesting. Patrick MacNee as Steed is unflappable but has a certain goofiness. Linda Thorson seems out of synch as if she's just a split second too quick or too slow with her lines and actions. Peter Jeffrey is quite good as the villain, but he is just a little too campy for my taste as well. This one left me just short of gamey: 2 libations. This episode is a slow starter as the only mystery early is when there might be a solid clue. Strange things seem to be going on that Cypher Headquarters. Steed works the outside and Tara goes undercover to find out what is going on. They have a meeting with the mysterious Mother, their control. One of their suspects is a Glass Cleaning company that outfits their crews in white jumpsuits and white bowler hats. Batman-type influence is strong here but the writing is particularly un-witty for The Avengers. What few sharp moments of dialogue there are seem forced and even Steed appears to be on automatic control, only brightening when he engages in some, oh-so-British repartee with the head of the Cleaning Company. Tara is festooned with her usual range of outrageous colored outfits. The second half of the episode is much more intriguing with a particularly surreal aspect that adds interest. This is definitely a case where style ekes out a victory over substance. The direction of this episode is very stylish and is the best part of it. Thorson still seems somewhat stiff in the role. Steed is very funny when his car is damaged by a ladder and he is uses his car phone to try to call Tara. Check out that phone! I toast this episode with two perfectly ordinary glasses. This is perhaps the worst Avengers episode I have seen. The plot involving the deaths of a series of ear-nose-throat specialists around the world is really quite absurd. I would think this was a late night sketch comedy version of the Avengers or a mislaid script from Get Smart. The dialogue is dull and the show is barely redeemed by Steed's cheerful pursuit of the answers to the mystery. Tara is mostly missing in action in this one, and Steed is urged on by his concern for her whereabouts. Well, there is actually one redeeming moment. As Tara is making her way through the bowels of a hidden clinic building she finds a place where ladders lead down through holes in the floor. She climbs down the ladder in one hole and stops when she hears voices. However, she has caught a cold (as does just about everyone in this episode) and sneezes violently and falls off the ladder. As we switch shots, we see her sliding out through the huge nostril of a huge nose that is on the wall of the clinic. Too much! Otherwise, this is definitely one episode that could be missed. In fact, it took me three tries to get through it. It features extended "British good old boy" scenes between Steed and the retired Colonel who finances the clinic, which is, surprisingly, dedicated to curing the common cold. Not enough to encourage any thirst so only a single medicinal glass for this one. Image Transfer Review: The first two episodes are very good with little or no scratching and film noise. However, the third episode suffers from consistent flickering and hairs and other film damage. It also seems to have an overall greenish cast. I can't help but envisioning someone pulling it out of the dumper. But, as stated, the other two episodes are very pretty and with the stylish direction one can (almost) ignore the lack of substance. 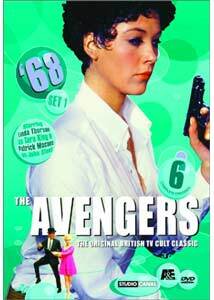 Audio Transfer Review: Sound has become an important part of my enjoyment of The Avengers on DVD. Much more so than I remember from watching the series on TV. Here the is transfer is quite fine and provides a nice platform for the work of Laurie Johnson, who scored these episodes. Nice work in the original and nice work in the transfer. Extras Review: Nice menu design and reasonable navigation on this set, I like the bubbly colors. This is one of those times when I could do without sound in the menu. As much as I like the Avengers' theme, it is annoying to have it blare out at me every time I hit the main menu button. This disc is pretty low on the totem pole for Avengers' extras. The Production Stills number only 6, and they are of fairly poor quality to boot. There is the usual web link to the Original Avengers web site and... that's it. Not much to recommend this disc of the set with only two fair episodes and one that is particularly bad. If you are not buying each set automatically, then perhaps a rental is order to see if you really want this set. Only a sip from a glass-and-a-half is all I can muster.